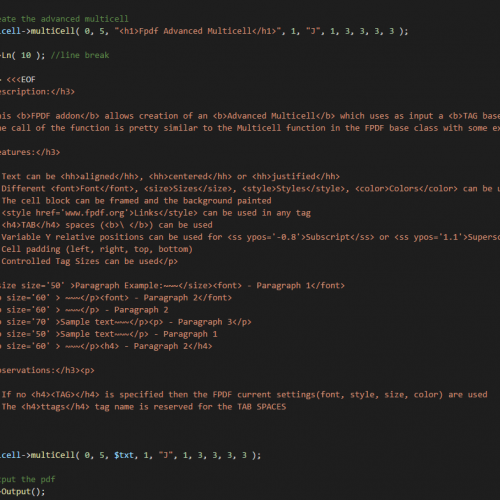 This TCPDF addon class allows creation of a “Advanced Multicell” which uses as input a TAG based formatted string instead of a simple string. The use of tags allows to change the font, the style (bold, italic, underline), the size, and the color of characters and many other features. The function is pretty similar to the Multicell function in the tcpdf base class with some extended parameters. 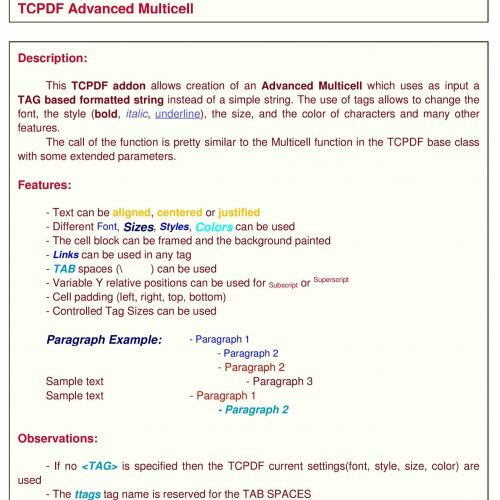 This <b>TCPDF addon</b> allows creation of an <b>Advanced Multicell</b> which uses as input a <b>TAG based formatted string</b> instead of a simple string. The use of tags allows to change the font, the style (<b>bold</b>, <i>italic</i>, <u>underline</u>), the size, and the color of characters and many other features. The call of the function is pretty similar to the Multicell function in the TCPDF base class with some extended parameters.